Combination Mobile Field Shelters comprising a unit that is part stable and part tack room are becoming more and more popular (it should be noted that these buildings may require planning permission), and are available in all our ranges. 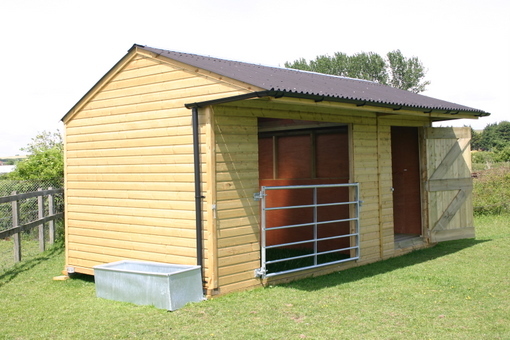 Available sizes vary across the ranges, but a typical configuration is a 5.4m stable and a 1.8m tack room (with floor) in a 7.2m mobile field shelter. 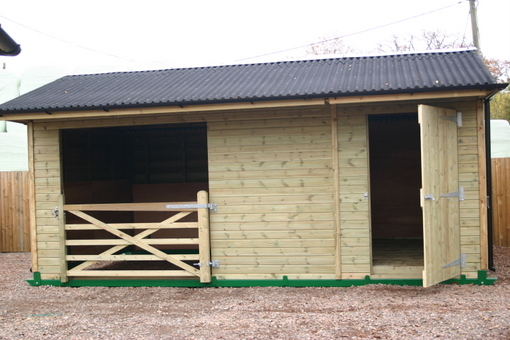 The Stable has a 1.88m opening (wooden gate shown not included) and kickboarded as per the range specification. The Tack Room has a 0.9m wide x 2.0m high door with three 16inch T hinges and 6inch brenton bolt, and a cabin hook is supplied to secure the door when open. The floor fitted in the Tack Room is on 100x47mm treated joists with 150x28mm treated floor boards. The Tack Room is fully lined (except Hawk range) to eaves height (2.2m) with the same lining as the kickboarding within the specific range, and the truss also boarded between Tack Room and Stable. As well as the standard sizes available across the ranges, we are happy to adapt any building to your own requirements and the possibilities are endless. This type of building can also easily be adapted into a workshop or store if required. Due to its skid size, we are also able to offer the Hunter range in lengths up to 10.8m long with 2 or 3 stable openings. Please contact our sales team on 01403-785508 for further details or for any individual quote.